Massive rendering power coupled with the latest render software, a great render manager and, of course, tons of processors. Free rendering storage with no cap. Free test renders any time. Highly competitive and flexible pricing. Fast, professional responses by real 3D artists who are passionate about helping you get great results. LaunchPad is our free plugin that allows you to render directly from your creative software suite. 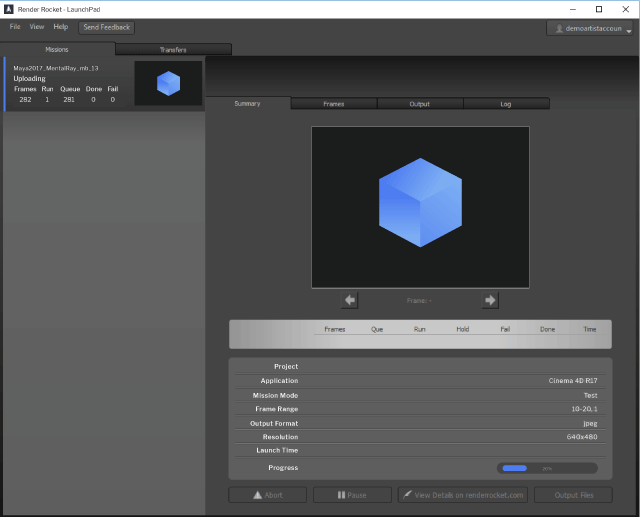 It automatically uploads files, analyzes the scene and downloads previews, simplifying the render process. Launch and monitor jobs using our advanced web tools. Total rendering time is charged to your credit card or pre-paid balance. Your rendering output is available as a web link (zip/rar file) or directly through FTP. Detects important information about your scene before you begin rendering. Lets you determine how you want the Render Rocket hardware to render you scenes. Allows you to break up large frames into multiple smaller renders to speed up render time. As veterans in the business, StratusCore has rendered millions of hours for clients, huge and small. We're constantly adding new features and are working on introducing more rendering software packages. If you need a tool that we do not yet offer, please submit a request to let us know. Be sure to include all relevant information, including version.